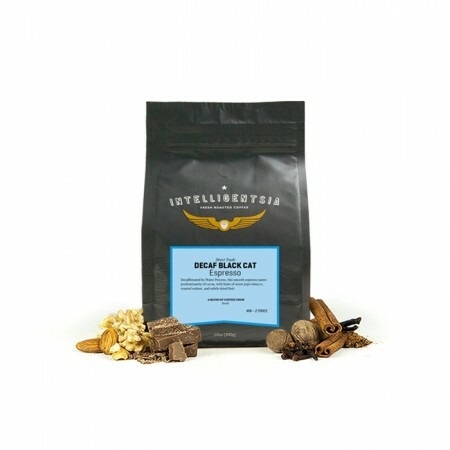 The Black Cat Decaf Espresso was roasted for you by Intelligentsia Coffee. This decaf coffee is from Brazil and was decaffeinated using the natural Mountain Water decaffeination method. This smooth espresso tastes predominantly of cocoa, with hints of sweet pipe tobacco, roasted walnut, and subtle dried fruit. Favorite Decaf so far. Send this one over and over! Better than the previous one. Still a little weak. I use 3 Tablespoons of beans and grind for 10 seconds at a setting a little less than coarse. Then brew for 5 minutes in 12 oz water. Is there something bolder you could recommend? Intelligentsia decaf is one of my favorites.